Rush Limbaugh is a very smart man. He has become fabulously wealthy hosting a popular radio show millions of people invest their precious time to hear. So, it is instructive to see a smart man’s plan to provide health care to those millions of his listeners. CALLER: I thought that Trump wanted to get rid of Obamacare. Apparently that’s not what they want to do right away. But if the government was so good at running the health care or dictating health care, why isn’t the VA or the American Indian plan a shining example of what government can do? RUSH: Great question. They can’t. CALLER: How long is it gonna take before somebody either asks Paul Ryan that or the American people just say, “Why isn’t the VA a shining example?” I mean there is government health care right there staring you in the face. I don’t understand it. I don’t get it. RUSH:You have just demonstrated that when the government administers health care institutions, they’re a disaster, okay? So why do you think they want to continue to exercise that kind of control and power over health care when every example of them doing it is pretty bad? CALLER: Because I don’t think it really has anything to do with health care. I think it’s just the redistribution of wealth, the power. That’s all I can think of. I don’t understand how they — if they can’t handle the limited amount of veterans that are in the VA system — and I realize that’s a lot of people, but it’s a limited amount compared to the population of the country, how are they gonna get 300 million people? Let’s stop here to remind you that the VA is a government RUN hospitalization program while the dreaded Obamacare is a government FINANCED insurance program. Seemingly, Limbaugh and his CALLER don’t understand the difference between actually managing health care, like a hospital does, vs. paying for health care like an insurance company does. Mr. Limbaugh: VA = hospital; Obamacare = insurance company. Get it? I also should mention that one of the biggest problems facing the VA is underfinancing by the Republican Congress, which wants America to believe that our Monetarily Sovereign federal government somehow can run short of its own sovereign currency, the dollar. The Limbaughs of the world have been making this false claim for at least 77 years. They were wrong in 1940; wrong in all the following years, and still are wrong, today. RUSH: Well, but you don’t have to focus just on the VA. You can look at Medicare and Medicaid. Does anybody want them expanded as the American health care? Well, yes, some people do! They’re the exact people you’re talking about. RUSH: Well, what do you think liberalism is, in part? About making these people feel good about the messes that they’ve made, all because they care and they have great compassion. And they’re great at using other people’s money, which is what Medicaid and Medicare are, to take care of people and keep ’em away from you. If put everyone on Medicaid and Medicare then you can assume they’re gonna have health care, problem solved. You don’t have to hear them complain anymore, you don’t see ’em, you don’t run into ’em. To Limbaugh, providing health care is meaningless, if you use other people’s money — which Medicare and Medicaid don’t. They use government money, created by the federal government. No “other people” involved. You must understand that Limbaugh is a multi-millionaire, who can afford any health care he wants. He doesn’t care about your health. He cares about his money. So he creates a false narrative to make you think he cares about your money and your health. Medicare and Medicaid are government financed insurance programs, which pay for excellent care and are much loved by the people who use them. There goes Limbaugh’s VA example, right down the toilet. RUSH: I think we’re gonna need to give Trump time. The thing we have to understand, folks, Donald Trump is not — he may be a political neophyte in terms of experience, but he’s not stupid, and he’s not dumb. And he has a track regard of getting done what he wants done more often than not. Actually, Trump has a rather poor track record “for getting things done.” Following his disastrous bankruptcies and thousands of lawsuits, when trying to do things himself, and his disastrous and crooked Trump University, for which he was fined millions, he pretty much has done nothing other than give his name to other people who did get things done. –Falsely claimed he won the popular vote because there were 3 million illegal votes against him. –Banned Muslims from countries that haven’t sent terrorists, rather than from countries that have. –Refused to reveal what must be incriminating tax returns. –Wishes to deport good people who have lived here illegally, but never have committed a crime, because . . . well, just because. –Denied he groped women after boasting that he did. –Is reluctant to condemn intimidation against immigrants, Muslims, and Jews. Well, why continue? You get the idea. Donald Trump has lied to the American people more than 100 times in just his first month in office. So what is it that we are supposed to “give him time” to do? And he knows there’s no benefit to him by telling everybody “I reformed health care. We got rid of Obamacare, we’ve replaced it and it’s great” when it isn’t. If it’s close, he might be able to get away with touting it as such. But, folks, there’s a huge obstacle still remaining in this, and until this thing is dealt with, I don’t know how you fix this. And that is this preexisting condition business. We’re talking about reforming health insurance, and when we get to that, we’re not even talking insurance. And now you will see the heart of Limbaugh’s “plan”: Don’t cover people who have pre-existing conditions. Yep, that’s the plan, folks. If you have cancer, heart disease or any other serious medical problem, you are out of luck. Providing health care for people with preexisting conditions is the equivalent of selling somebody a homeowner’s policy for a hundred dollars while the fire is burning their house down. It just doesn’t happen, yet in health care we’re doing it. And it screws up all of the actuarials. And nobody in Washington has the guts to eliminate coverage for preexisting conditions. But the Democrats don’t want to. That’s exactly the kind of thing they want health care to be. Right. Private insurance won’t cover people with pre-existing conditions, but the federal government can and should. That is a primary benefit of Medicare. My health care fix, do you know what it is? I’m so simple-minded in these things. I’m not complex at all. I have no desire to run anybody else’s life. I don’t care whether somebody can run theirs or not; that’s their responsibility and their problem. I’m not interested in making sure you don’t screw up other than what I do here, but I do not live under any illusions that I should tell everybody how to live. 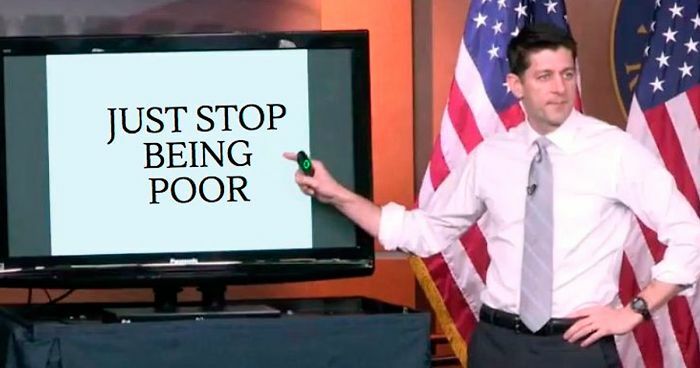 My health care reform plan is real simple. For everybody who can, and we would have to have a very, very honest assessment of that, you buy your own. Ah yes, he’s just a “simple-minded” man. How modest of him. That “very honest assessment” is Medicare and ACA. What he’s describing is exactly what he’s advocating against. He just isn’t clever enough to realize it. You can either get it from your employer as part of your deal there, or you don’t and you go out and make your own deal. There are insurance companies all over this country selling health insurance, and they’re competing with one another, and you buy what you need. And if you’re 25 and you don’t want to buy the kind of health insurance where you go to the doctor 15 times a year, you don’t. If all you want to buy is insurance for when you have a car crash or some other calamity, that’s what you buy, and you’re not responsible for anybody else. Huh? How is anyone supposed to know if or when they will be involved in a car crash or other calamity? What kind of decision-making is that? And what does the phrase “you’re not responsible for anybody else” mean? Where in Medicaid or Obamacare does it say you’re responsible for “anybody else.”? And everybody else does the same thing. You buy what you want. And then what you can’t buy, you insure. This is one of the screwier comments. You buy the insurance you want, and then what you can’t buy, you insure. What does that mean? And that would be catastrophic, terminal diseases, long-term care. If you want to invest when you are 25 years old in a retirement home that has health care, you buy it then and start making payments on it. Your responsibility, you do it. “But Mr. Limbaugh, Mr. Limbaugh, what about the people that can’t afford it?” That’s where we are a compassionate country. And people who can’t, we have a plan, but we’re not gonna assume nobody can pay for it on their own anymore! To me, there ought be no guarantee, just like no hotel is the same, health care, where is it written that no matter where you go to get health care it’s just as good as where anybody else goes? You know that’s not the case already. You know there are places that specialize in treating cancer that are better at it by reputation than other places, but not everybody gets to go to those places. It’s just the way it is. And even now, with government running it, we don’t even promise people that they’ll get the best. And how do you know what the best is anyway until there’s competition and the best is determined by who has the most customers and who sells the most service and who does the best job by virtue of the market telling everybody that? Does health care really work that way? Would you want to go to a hospital that cuts costs so it can cut prices? Would you rather go to a hospital that has the most up-to-date (though expensive) equipment, or a cheap hospital? We’re not talking about cars or sofas. We’re talking about your health. We’re talking about life or death. Health care is anything else you buy. In my plan, the prices would start plummeting left and right. My plan would be introducing market competition. If people are in the health care business, you think doctors are doing what they do just for the service? You think people that run hospitals don’t want to make money? Everybody wants to make money in everything they do. And competition is one of the greatest ways of weeding out the good and the bad, and it’s a way of making everybody better. No, it isn’t a way of making everyone better. It’s a way of making everyone worse. Patients are not capable of judging hospitals the way they judge wallpaper. Cheaper isn’t better. Clearly, Limbaugh neither knows nor cares to know anything about the health care world. To him it’s all, money, money, money. When I was a kid, I went to the dentist when necessary, left the dentist’s office, he sent a bill. Parents paid the bill, that was it. Same thing with the pediatrician. There were house calls, although I’m not making a stink about that. The point is, you could afford it. If it was something catastrophic, then of course there was insurance available or you made a deal with the hospital to pay it off over time, what have you. If you can’t pay for it, you pay for it in installments or what have you. But why did that system fade away? It faded away because it didn’t work. The fact that it faded away should have been a clue for Limbaugh. Doctors and hospitals eventually began to reject people who couldn’t pay for services. One wonders what Limbaugh’s reaction would be if his station manager told him they couldn’t afford his pay. Okay, that’s the headline of the Breitbart piece. Let me ask you a question. I mean, the way I react when I see a headline like this, if it’s this bad, how in the world can the people in charge of it not know it’s this bad? If it is this bad, then why do the Republicans want to hand power back to the Democrats? Why do the Republicans want to hurt Trump’s base? I can’t wait to learn the answer. Now, that I can answer. Why do Republicans want to impose crushing costs on voters? Does any of this make sense? And why do Republicans want to hand power back to the Democrats? And why does Trump want to do that? Trump supposedly signed on to this. So Breitbart claims here that this Obamacare repeal and replacement bill actually targets senior citizens in Michigan, Pennsylvania, and Wisconsin and makes their tax credits less effective and raises their health care costs. Those are three blue states that Trump won. Why would the Republicans do that? Do you think that’s in the bill? Hint: You will see that Limbaugh’s argument is quite simple: Trumpcare is so awful that no sane political party would support it. Therefore it isn’t what you think it is, though he has no idea what it is. Oooh, how awful. The federal government, which can afford anything, might pay for the health care of illegal immigrants rather than allowing them to die in front of a hospital’s doors. And those federal payments not only would save lives but also help stimulate our economy and provide consumers of our products. But who wants that if we can be cruel and stupid at the same time? Do you think the Republican Party still believes this business that if they don’t do something about shoring up their support from the Hispanic community, they’re political toast? I think they still believe it, no matter what happened here with Trump. And so can you see them putting in an Obamacare replacement bill a little provision that nobody may find that says illegals do not have to prove immigration status in order to enroll in health care? Do you think them capable of this? The Republicans, I’m asking. And would Trump sign off on this? I’m just asking. Get it. Now Limbaugh moves past ignorant to crazed. He hints that the Republicans will insert secret provisions that no one can find (except the immigrants) to appeal to immigrants. Number 3. “Obamacare 2.0 will be labeled as ‘Trumpcare,’ and Democrats and their media allies will highlight every hard case” they can. After this thing’s enacted, they’re gonna run around the country and they’re gonna be doing story after story after story, person after person after person denied treatment and blame it on Trump and the Republicans for hurting the poor and the elderly. Uh, yes. That is exactly what a political party does, and thank goodness for it. How else will the public realize the full witlessness of Trumpcare? Nobody in the federal government worries about the cost of anything. If they did, there wouldn’t be a 20 freaking tSov federal government should worry about the cost of anything, and they shouldn’t worry about the “freaking trillion-dollar national debt” either. The national “debt” is nothing more than the total of deposits in T-security accounts at the Federal Reserve Bank. That fearsome national debt is just bank accounts. Unfortunately, Limbaugh who writes about things economic, seems not to understand one of the basics of economics. Let me ask you a question. I’ve spent, well, 43 minutes minus six, 37 minutes talking about this. Do you know any more about it now than you did when I started? Yes, I know that you, Mr. Limbaugh, care nothing for the 99%, the people who listen to your show, and I know you are beholden to the 1%, the people who want to keep the 99% down. And I know you don’t understand economics, though you blow about it constantly. And I know the right-wing would rather commit political suicide than to help American men, women and children achieve healthy lives. But I guess I always knew that. Trumpcare only confirmed it. Listen to a dishonest politician claim the Congressional Budget Office is dishonest for disclosing the fact that Trumpcare would take health care from 24 million people. Wants to abolish the CBO. The irony: Those red states that didn’t expand Medicaid don’t want the people to have healthcare. Now they suddenly want those people to be covered. Fortunately, the White House has no history of lying. Even some (former) Trump supporters I’ve seen have been hitting Peak Donald Trump and see him for the clown he truly is now, though it should have been obvious from the start. A pure cheeseball through and through. This is a damn disaster. Trump’s stupidity + sadist GOP libertarian morons = a nightmare scenario. It’s a secret, didn’t you know? Trump with or without Rush wants to crush the GOP. [Maybe even Trump hasn’t seen that] But once the GOP is decimated in elections he can ride in with a universal healthcare deal and save the day! [Ahem.] It’s the only thing that makes sense. My take on this: Trump doesn’t care about the Republican Party. His sole concern is how much money he, Jared and Ivanka can steal earn from his Presidency. You will see repeated stories of their conflicts of interest — so many stories the whole issue will lose its meaning. The Trump family will steal make billions out of this Presidency, and his “religious” right followers won’t care. look up the word selfish and you’ll see a picture of Trump next to it.